Thanks to all who shared our final Hot Dog with a Deputy of the summer with us on August 14th. We wrapped up the Hot Dog with a Deputy summer series at Community Park in Falcon Heights, joined by Falcon Heights Park and Rec staff, our partners from the Ramsey County Emergency Communications Center, our friends from the City of Falcon Heights, and members of the Falcon Heights Fire Department. We served over 400 hot dogs, launched untold numbers of beanie babies into the air into a field of joyful kids, and shared meet-and-greets with our K9s, Mounted Patrol, SWAT team, recruiters, youth Explorers, citizen volunteers, Dive Team, and agency leaders. 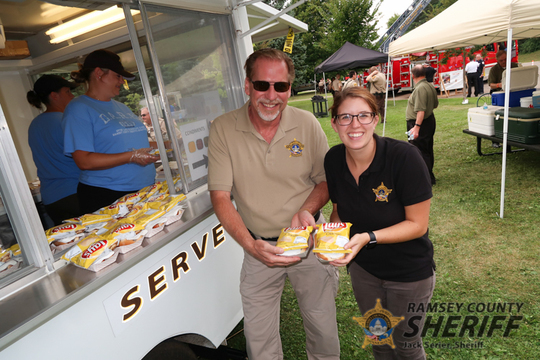 Our summer Hot Dog with a Deputy series is an important part of our community outreach, allowing us to build lasting connections in the communities we serve; we're already looking forward to summer 2019! 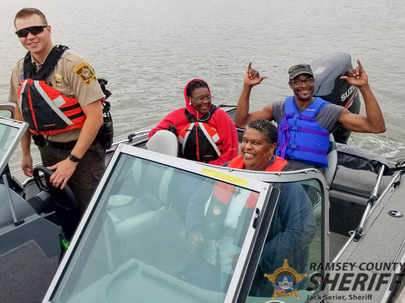 One morning in late August, we received a call of a water emergency near the south shore of Lake Owasso in which two people were stranded on a boat that was taking on water. Quick-reacting citizens picked-up the stranded boaters and got them safely to shore, but the boat didn't fare as well. Enter our phenomenal Water Patrol and Dive Team members, who deployed later in the day on a dive operation to bring the boat out of the water. 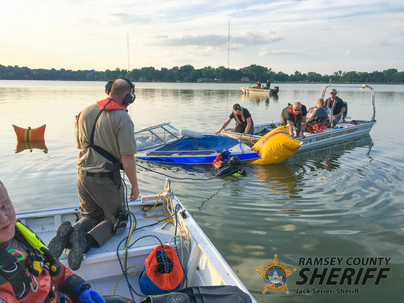 Divers installed "lift bags" to the boat, which gave it enough bouyancy for it to be towed back across the lake to the safe haven of its owner's trailer. Learn more about the role of our Water Patrol Unit. "I had no friends. I had nowhere to live. I had no dreams." This is where Berlynn Fleury was three years ago when Deputy Dylane Wallat met her during a court transport. Deputy Wallat, who is a veteran of the United States Army and served in Iraq from 2005-2007, remembers that Berlynn had a "rotten" attitude and admitted to Deputy Wallat that she was withdrawing from drugs. Deputy Wallat also knew, though, that Berlynn was a fellow veteran, and she attempted a "heart to heart" talk with her. That first talk didn't go over well, but over the course of the next year, Deputy Wallat made a point of stopping in to check on Berlynn when she was attending Veteran's (Vet) Court, and she saw things were beginning to change for Berlynn. 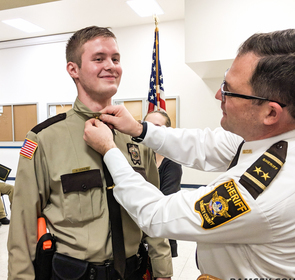 Eventually, a new assignment for Deputy Wallat took her elsewhere, and over the next two years, she lost touch with Berlynn. Deputy Wallat thought about her often and wondered how she was doing. A few weeks ago, though, Deputy Wallat opened her email to find a message from Berlynn with good news - she was graduating from Vet Court and wanted Deputy Wallat to be there. 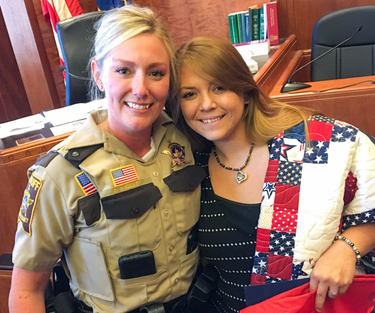 Deputy Wallat contacted the Quilts of Valor Foundation to arrange to have a quilt presented to Berlynn at her graduation ceremony on August 22nd at the Ramsey County Courthouse in St. Paul. No matter where we go, where we work, or how much time goes by, the connections we make with you matter. Congratulations on your graduation, Berlynn - cheers to a life full of friends, a safe home, and big dreams. Learn more about Veteran's Court, a program that is overseen by the Ramsey County Attorney's Office. Sometimes life goes directly past the lemons...and just hands you lemonade! 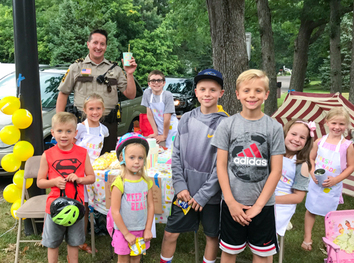 Commander Ramacher joined this awesome group of kids recently at their lemonade stand in a Shoreview neighborhood. What makes this stand so special? The awesome kids who run it! The kids are in year #6 of the lemonade biz, and they generously donate their profits to the Ronald McDonald House Charities, Upper Midwest. These great kids also earned an 80% tip on the bill from Commander Ramacher, who noted the excellent service and cool cup and straw. We say it over and over - we have great people in our communities, both young and old, and we are proud to serve you. Flashback to September 2017 when an incredible group of our public safety partners joined up with us to remember and honor our friend, Deputy Ron Valento. 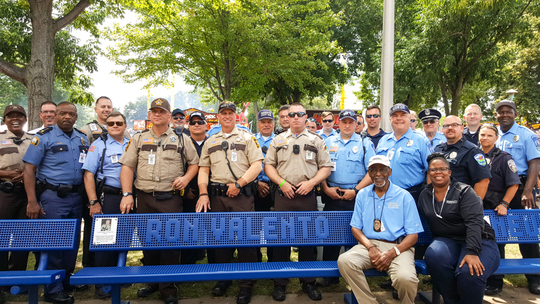 The bench, which was placed by Deputy Valento's family, can be found in front of the Arthur R. Blakey Jr. Police Station at the Minnesota State Fair Grounds. 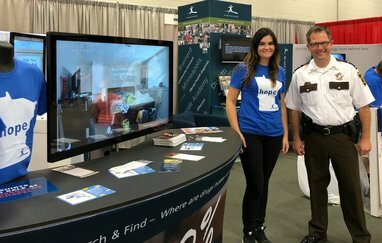 The "Great Minnesota Get Together" was a great opportunity for Sheriff Serier to join up with our friends at Mn Adult & Teen Challenge and talk with fair-goers about opioid abuse, along with reinforcing a message of hope. “Helping people with addiction is a community wide issue. No one can overcome it alone. We are asking everyone to help in this commitment to healthier communities,” says Sheriff Serier. Join us for a Ramsey County Community Forum on November 1st to address the opioid crisis. 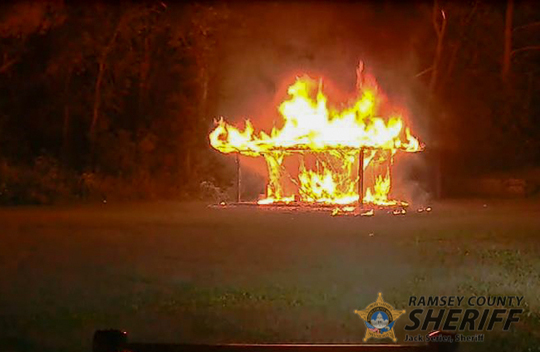 On September 1st at about 11:30 pm, we responded to a report of a fire at Hazelnut Park at 3301 New Brighton Road in Arden Hills. The fire was started on an ice rink warming house and has been confirmed to be arson. Please contact Criminal Investigations Unit Investigator Dan Eggers at 651-266-7325 with any information related to this fire. Not to be outdone by the proud parents in our communities, several of our School Resource Officers (SROs) got in on the "First Day of School" photo action earlier this month. 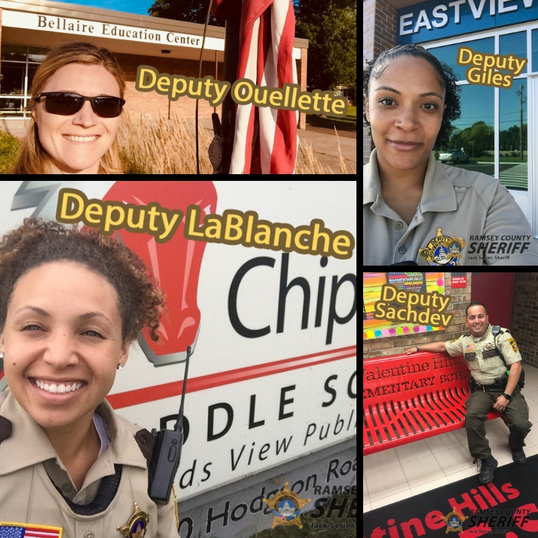 The RCSO has a total of seven SROs who are based in schools throughout our contract communities of Arden Hills, Shoreview, White Bear Township, and Little Canada and are responsible for responding to crimes that happen on school grounds and ensuring the safety of both students and staff. Our SROs will tell you, though, that a major part of what they will do throughout the school year has more to do with building relationships. Our SROs will get to know the students in their schools, learn about their families and friends, help them navigate their struggles and challenges, and connect them with resources. Cheers to a safe, educational, and positive school year for all. 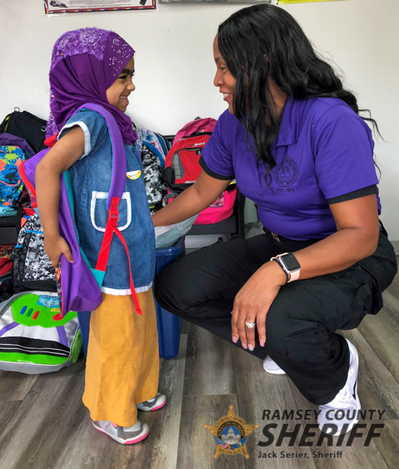 We had fun teaming up with the Saint Paul Police Department and the Minnesota Chapter of the National Black Police Association (NBPA) recently to get some great kids in our communities prepped for school. It was all a part of the NBPA's annual back to school backpack and school supply giveaway that treats kids to free haircuts, hygiene kits, and new backpacks. Sharing a Slice of "Lake Life"
Our Water Patrol Unit treated a group of young adults from the Hubert H. Humphrey Job Corps to a slice of Minnesota "lake life" recently. And for some of our guests who had never been on a boat before, this was an even more memorable experience. We appreciate our guests taking the time to connect with us and learn a bit about water safety and the Sheriff's Office. 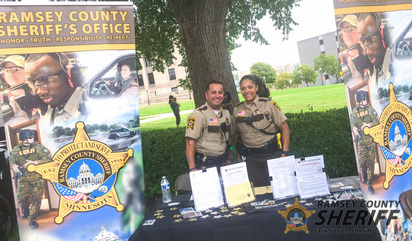 Year #2 of IndiaFest on the Minnesota State Capitol grounds presented Deputies Sachdev and Giles with a great opportunity in August to chat with festival-goers about a diverse variety of topics, including the opportunities we have available to join the RCSO. Are you curious about what we have to offer and different ways you can serve our community? Check out our opportunities. Hagos Tsegay Melake was murdered in the early morning hours of Thursday, August 29, 2013. Shortly after his death, Hagos’ debit card was used in North Minneapolis by the unidentified woman pictured below. She is not a suspect in his death, but she may be a witness. If you have any information about her identity, please contact the Criminal Investigations Unit at 651-266-7320. 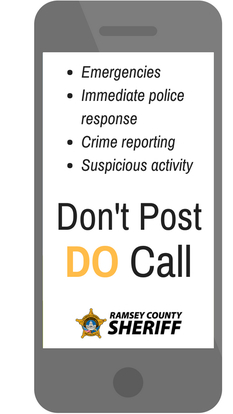 If you prefer to remain anonymous, you can submit a tip through Crime Stoppers of Minnesota. 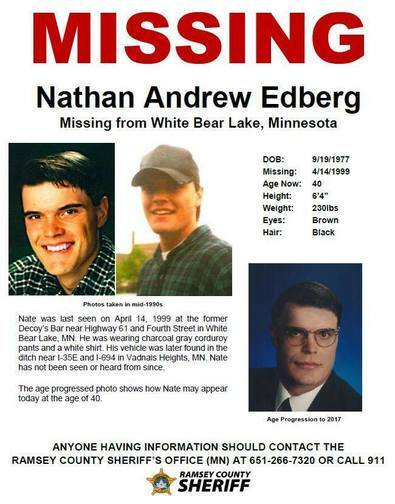 Learn more about our unsolved cases. Become an Explorer with our Law Enforcement Career Exploring Program, designed especially for youth ages 14-21 years old who want to learn more about public safety careers and serve our communities. Join us at our annual Explorer First Nighter, an informational meeting for prospective new Explorers and their parents. Explorers participate in Sheriff's Office activities and help us with community events, alcohol and tobacco compliance checks, and partner with the Water Patrol Unit to patrol the county’s lakes, parks, and trails. Sound interesting? See complete details.